This birthday design is from our Polka Dot & Stripe Collection. 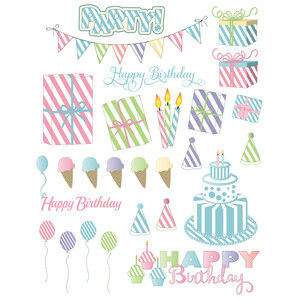 Pastel, striped patterns and coordinated colors on print and cut planner sticker sheet. Each element can be cut and printed individually. They can be used on window clings, tags, cards, charts, planners, stamps, scrapbooking, labels - wherever you can put a sticker or label! They can be re-sized without affecting the quality. The entire collection can be viewed at: http://www.scribbles.graphics/stripes-polka-dots/.